Although I don't exhibit other obvious signs of masochism, I periodically visit Tech Central Station to see what the Dark Side is currently spouting. Just now I found this interesting squib from Roy Spencer: http://www.techcentralstation.org/062005G.html posted on May 20th. Given that it must have been written around the same time he became aware of the need for the satellite revision, one has to wonder what he was thinking. The main differences between UAH (Spencer and Christy) TLT and the TMT satellite records are as follows (I'll try to be brief!). The MSU devices (Microwave Sounding Units) on these satellites take their temperature measurements using repeated scans of downward looking sensors. These sweep from left-looking to right-looking views across the satellite's orbital path, passing through straight down (nadir) along the way. They have multiple channels that sense at different frequencies, each being most sensitive to a particular layer of the atmosphere. The one that's of interest here is Channel 2, which gets its signal from a layer of the atmosphere that peaks at around 800 hPa and dwindles out above 50. 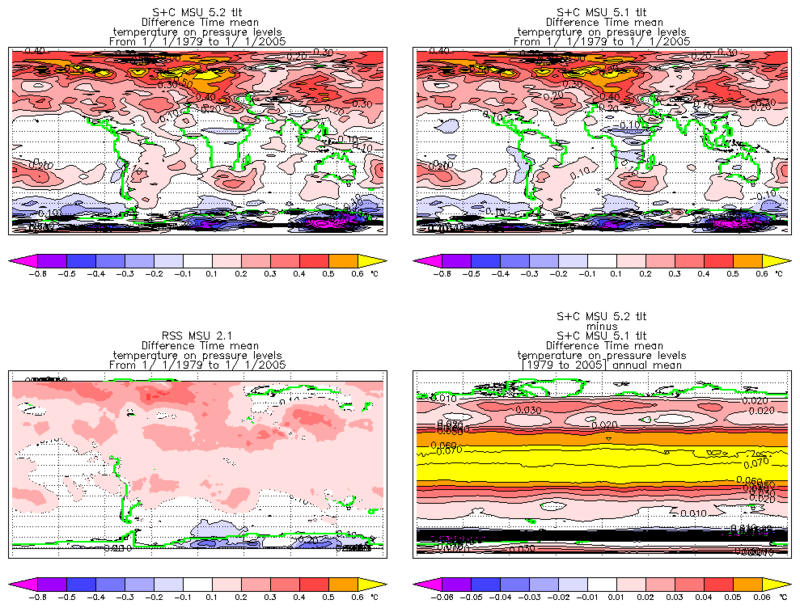 Channel 2 measurrements are a good representation of "middle troposphere" temperature--that is, the "bulk" temperature of the troposphere below the tropopause but above the surface. For a clearer picture see the paper I wrote on the satellite record at my web site. In particular, note Figure 7. The problem is, what's of interest to everyone is the lower troposphere (e.g. - 1000-800 hPa roughly) and this isn't directly measured by MSU's (it needs to be remembered that these devices, which have been in service since the 70's, were not designed with global warming data gathering in mind). 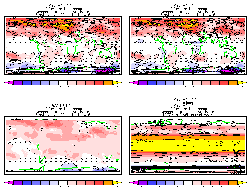 About 15 years ago Spencer and Christy discovered that the side-looking and straight-down views of the MSU sensors across each of its sweeps could be factored and combined in a way that would give a temperature for the lower part of the troposphere. Because it is derived from the MSU Channel 2 data by formula, this was referred to as a "synthetic" channel and designated "2LT". With the latest versions, UAH has begun designating this as "TLT". So TLT is UAH's lower troposphere temperature product that is derived from the actual MSU Channel 2 measurements. What they designate as "TMT" is their uncorrected Channel 2 product that gives the "middle" troposphere. Lower Troposphere: TLT -> RSS plus Fu method correction. Middle Troposphere: TMT -> RSS. When I was getting my Engineering Degree, my papers were routinely marked up in red anytime I did any "zooming" of data to make it look pretty. I look at all of the climate "anomalies" graphs and wonder if any of the science professors ever get their red pens out. Showing "anomalies" might be reasonable, but only if the raw data is also displayed. Personally I would prefer to see the graph in deg K starting at 0 K (or R if you prefer), but such transparency seems to be lost of climate researchers seeking more funds. The worrisome aspects of climate change become rather difficult to see when put in perspective. Of course this is why my Professors kept marking up my work in this particular area. Maintain perspective so you make good decisions. Every time I see an Anomalies graph published without a contextual Temperature graph next to it, my BS meter gets pegged. This has been created by the Excel Generation of scientists (AKA Spreadsheet Man). I hope that rationality returns to the sciences eventually, but I am not hopeful with the nonsense that abounds today.